At the 1998 Politically Correct love-in known as the Academy Awards, director James Cameron's latest piece of mega-budget propaganda was the inevitable shoe-in for Best Picture. 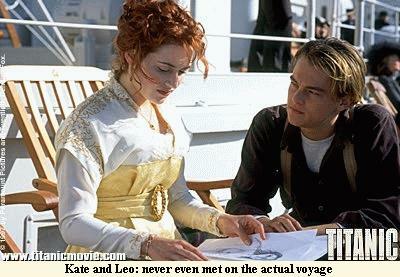 This was hardly a surprise, as it must be the 555th movie or TV program on the "Titanic". 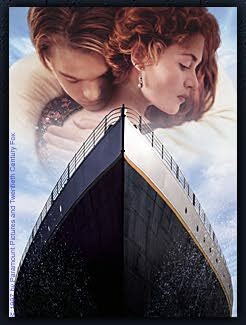 Titanic inevitably rang the Academy bell because Hollywood is Hollywood and what happened to the victims of the Titanic is not only the longest lasting, but probably the most effective propaganda exercise ever. Hardly a day goes by that the press, radio and television don't mention something about the 1500 alleged to have drowned. The figure is nonsense but media folk go on parroting what everyone "knows". I used to do the same. There have been many other disasters at sea, and most of them have hardly warranted a paragraph, let alone movies. Has anyone made a film about the 1,200 killed on board the RMS Lusitania, or the death of 1,100 on the RMS Empress of Ireland? As even The Titanic Resource had to reluctantly admit, "True, there have been worse maritime disasters, but the power of the Titanic story has an enduring quality that appears will never die." Any serious revisionist inevitably must ask why the establishment has pushed the Titanic myth on the public so tenaciously. Just look at the unusually long list of films that have been made about this alleged tragedy alone! What other maritime tragedy has warranted such a barrage of Hollywood propaganda, not to mention hundreds and hundreds of books and articles, as have surrounded the alleged Titanic? Lots of people have died in many sea disasters. The Northern Shipwreck Database has archived more than 65,000 records of marine casualties over the last four centuries! What makes the suffering of the Titanic so special? All of this has culminated in James Cameron's most recent production. After eighty-five years the moguls of the movie world reckoned the time was right to cash in in a big way. And Cameron reckoned it was time for him to cash in too. "Movie of the year! Cameron takes on the Titanic! ", screamed the cover-page in Newsweek magazine. You would have thought the disaster had just happened and that the film was the biggest event since the Battle of Britain. This film, however, contains so many flaws and inconsistencies that it is absolutely worthless as a credible historical piece. Let's start with the fact that the two principal characters, alleged to have had a dramatic love affair aboard the doomed vessel, were, in fact, simply names picked at random from the ship's manifests. There is no evidence that these two persons even met during the actual voyage. Even the filmmakers are forced to admit that this movie - purporting to represent a historical event - is, in fact, a work of FICTION, just like Amadeus and Schindler's List! Am I suggesting that the boat did not sink, or that dozens, maybe hundreds of people didn't get wet and cold and maybe even broke an ankle? No. But propaganda is selective, and Hollywood propaganda is the most selective of all. There is no physical evidence that 1500 went down with the ship. Eyewitness accounts contain so many discrepancies as to make the whole story unbelievable. Some say the ship split in two before it sank, other's say it didn't. 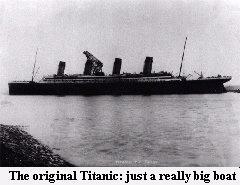 And it should also be noted that there were more than 16 lifeboats on board the Titanic - 17% more than required by law. The ship was probably scuttled (intentionally sank) after all the passengers and crew were safely aboard the lifeboats. They all escaped and filed monstrous insurance claims. The whole thing is a titanic insurance hoax. That is why the tear in the hull allegedly caused by an iceberg has never been found. All the hull damage that has been found and documented could have been caused by the ship hitting the sea floor. And where, exactly, is this so-called iceberg? How can revisionists be expected to accept that 1500 people were killed if the very instrument of their destruction is not even available for examination? Based on a complete lack of physical evidence alone, it is safe to dismiss the conventional Titanic story. ...But don't listen to us... see it for yourselves! So Where did all the bodies come from? THE MAD REVISIONIST: We do not recruit; we convince. Truth has no need of coercion. We invite your support and submissions. DISCLAIMER: All editorial content on this website is strictly not the writer’s/author’s opinion. THE MAD REVISIONIST, located on the moon, is owned and operated by accident. The content of this page is the copyrighted property of THE MAD REVISIONIST. Any illegal copying or circulating of this page, in whole or in part, without the expressed permission of THE MAD REVISIONIST will be taken as a compliment. And if you want to know how the movie ends... the boat sinks.